Kill All Happies is not the first book I've read by Rachel Cohn, but it is the first book I've read that's she's written by herself. The other two books I've read were co-written by David Levithan. (Yes, I'm totally talking about the Dash and Lily series.) I've had a few of Rachel's other books on my TBR as well, so I was curious to finally read one of her books. 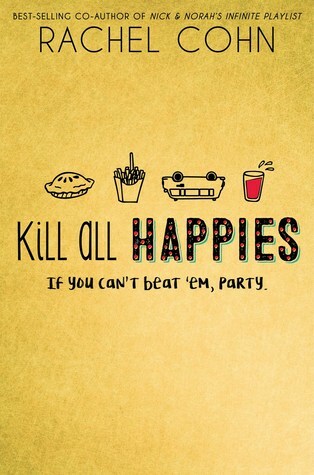 I've read quite a bit of summer-themed books lately, and Kill The Happies could also make that list as well. The characters have just graduated from high school, and they want to have one last hurrah at their favorite restaurant/theme park, which is closing down for good. What should be a simple fun for the graduating senior class turns into so much more when fans of the closing park arrive to have a party of their own. I really enjoyed the setting of the book. I love a good amusement park, and Happies sounded like it was a cool place to visit when it was up and running. It actually sounds like a little amusement park we have where we live, a place I love to visit. I don't know how I would feel if it were to ever close down! Reading about the party itself made me more than a little anxious. The party was pretty wide, and I was actually a little surprised at the amount of drinking and drug-usage throughout the story. I'm no prude, but this seemed a bit... much? Maybe that's me though. Overall; I'm really not sure how I feel about this book at the moment. There are parts I enjoyed, mostly the amusement park parts, but the rest really didn't quite work out for me. If you're looking for a quick, end-of-school read, this book may be up your alley.